General Characteristics: Short to medium in height, moderately spreading, maturing within 9 to 12 months, producing from 2 to 5 oha; the dark green petiole with conspicuous, broad whitish edge is the chief distinguishing character. Petiole: 50 to 70 cm. long, dark green with conspicuous, broad whitish edge, a brilliant dark pink ring at base with light pink for 3 to 5 cm. above. Leaf blade: 35 to 50 cm. long, 25 to 40 cm. wide, 30 to 40 cm. from tip to base of sinus, ovate, drooping, dark green; margins slightly undulate; piko light green to light brownish; lobes acute with wide sinus. Corm: Flesh white with inconspicuous yellowish fibers; skin pale pink. 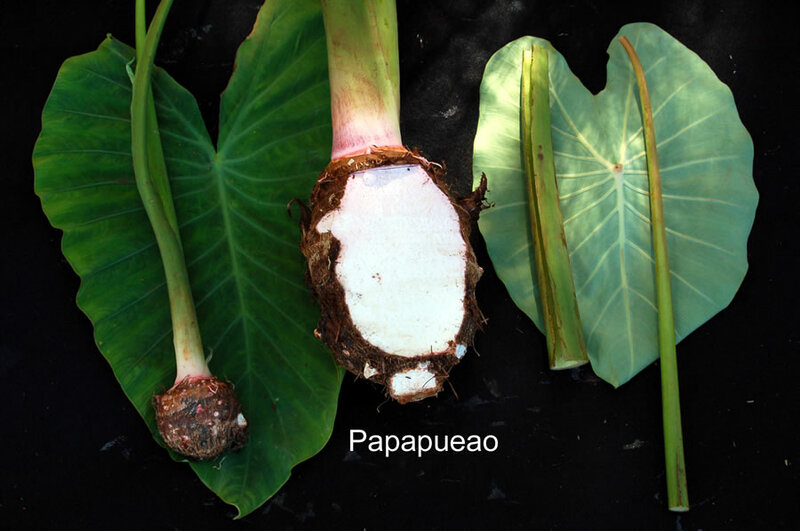 Origin, and derivation of name: Native variety; the name Papapueo may indicate that this is an old variety in Hawaii, papa meaning "ancient" and pueo, "a land section." Distribution: Grown to some extent on Maui, under wetland culture, but very little elsewhere.